In Part 4 of this blog series, we added the ability for the user to interact with the game using all forms of User Input, (i.e. Touch, Mouse, GamePad, etc.). Now, we need to make the game much more graphically astute and provide a more pleasurable experience. To do this we need to add some animation and a more realistic background to the game. When we added the graphics in Part 2 of this series, we included a sprite sheet which has eight (8) pictures of different states of the player ship. We will now use this to create an animation for the ship's movement. If we treat each of the different picture states of the ship as frames, we can cycle through each frame continuously throughout the game loop to given the illusion of ship fluttering; thus providing animation to the game. 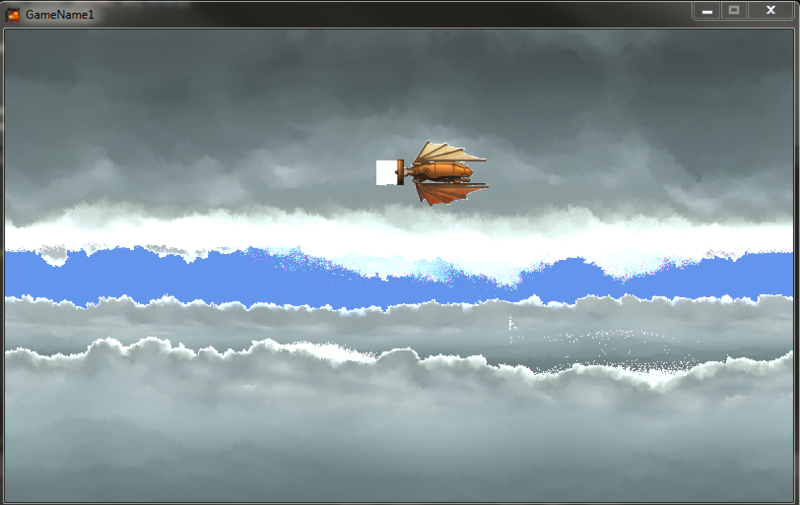 In order to provide a realistic background to the Shooter game, we need to simulate the sky with clouds moving as the ship flies through the background. So now let's add animation to the ship. In order to do this, create a class called Animation. Add a new class to your project by right clicking on the Win8Shooter project and selecting Add and New Item, select Class or by pressing SHIFT + ALT + C, and typing in the name Animation.cs. Press ENTER. You'll notice, much like the Player class, we have an Initialize(), Update(), and Draw() method; animations need all three to be able to work right. Let's start by filling out the Initialize() method. We will add some parameters that we can pass in each time we create a new animation, and then we will store the parameters to control the animation. Now, any object we want to draw on the screen can be animated using this class. Right now, the game is using a simple Texture2D to represent the player graphically on screen, but we can now leverage this class to animate the player graphic on the screen by cycling through each frame of the sprite sheet using the Animation class. The only step left is to tell the game to create the Animation and Initialize it with a sprite strip graphical file. The appropriate place to do this is in the LoadContent() method, where we were previously loading the static texture. Find the LoadContent() method in the Game.cs file. You should still be able to move the ship around just as in the previous step, but now, you should see some fluttering effects from the sails and steam from the back of the ship. Create a class for this new type of parallaxing background object, write all the necessary functionality inside it, and then link it up inside our Game1 class. Add a new class to your project by pressing SHIFT + ALT + C, and typing in the name ParallaxingBackground.cs. Press ENTER. // If we divide the screen with the texture width then we can determine the number of tiles need. In conclusion, this walkthrough demonstrated how to create an animation class that can be used to animate textures by cycling through the frame sprite sheets. We used this class to animate our player texture and make our ship behave realistically. Afterwards, we went through the steps to create a base background and create the illusion of the sky moving within the game by creating a parallaxing background. In Part 6 of this series, we will add logic to create enemies and animate them through the game, in order to present a challenge for the player of the game. I learned a lot from these blogs. I know it is minor; but we need to declare varaiables, bgHeight, bgWidth, bgLayer1, bgLayer2. Thank you very much for such a great blog. Thanks for a great blog, can you suggest any open source tool to create those graphics like in skydrive. GraphicsDevice.Viewport.Height); in the initialize method. great blog… looking forward to the next parts. Amazing series, thank you Tara. I am following the series in windows 7, vs2012. My game has a problem rendering the images, it looks like that where should be transparent, it is drawing white… what could be wrong? Now, everything is working and looking nice. In the event you are using Windows Live Writer to publish your blog entries, for the code snippets plugin you should deselect the "Alternate lines" option so your code snippets do not get spaces inserted between every line. Selecting "Use container" will add a box around the code to help separate it from the blog text. Good stuff, although I have noticed a bit of a stutter in the scrolling as if the wrong position is being used…possibly a mistype but I can't see it and would be eager to hear if anyone else has had this problem. Looking forward to the next article. Just wanted to say that this is an excellent tutorial and has helped me a lot. Great serie! I'm waiting for the next parts. …and bgHeight, bgWidth, bgLayer1, bgLayer2 declarations?? Great tutorial series. I'm really looking forward to the next one. I do have a question about this one though. Could you explain this line here? I noticed when setting the animation like this, the position of the image is off (left and up by 1/2 the width) from where the actual object is. This is noticeable by the collision detection for borders allowing the graphic to go half off screen to the left and top, and be half an image width away from the right and bottom when it is forced to stop. I fixed that particular issue by just removing the subtraction part — but I was curious what the purpose of it was to make sure I am not breaking something by changing it. That seems to fix the problem fpr the time being and works with increased scale. Thanks Tara, these are great tutorials! I created a public repository that follows this tutorial series. Maybe it could help some one following along. It also adds a fix for the jitter happening with the backgrounds. Guys: Part 6 is almost complete; I wanted to rollup all the great changes and enhancements that you all have done so far. Teicher: I love your options for the jerking that happens on some devices (doesn't happen on my X1Carbon but a little on my Samsung) so I tested your code and I like the change. So I want to update the Part 6 to note your changes and give you a little shout out for it and direct them to your link if they want to implement your change. It is coming (Promise) ..working on APIMASH projects (on channel9 and github if interested) and 3 blog posts at once slowed me down a bit. Next week, you should see some new updates. I think this is excellent thank you so much, I was wondering how part 6 is coming along ? I know its only been a month and you are obviously busy . .
Is there any way to get windows phone SDK running a 32 bit windows 8? maybe with the new monoGame Installer 3.0.1? provides a few new options like windows 8 phone project. Pleeeeeeeeeeeeeeease Part 6! Don't leave us hanging from a cliff 😉 You can do it!!! Go-go-go-go!! Coming, I promise. Working on 3 apps/project; Part 6 to this tutorial, MonoGame Honeycomb Rush tutorial with Game State Management, and Windows 8.1 apps and the blog posts to all of those. PROMISE. Trying to make sure the code works of all of them before you all hand me my head for it not working and I posted prematurely. 🙂 Coming, almost finished with them. Part 6 summary will be here and the full tutorial will be on the new blog. 😀 thanks A LOT! Please share the new blog's address when you get a chance. Looking forward to it! This is a great tutorial. I learned a lit from it. Just waiting for the 6th part. Hope you will publish soon. This tutorial has been fantastic. Any status on part 6? Hi, I am having a problem with the Parallaxing Background, the layers start in random places and they reset around the middle without reaching the end. Check out the next post in this tutorial, when Tim Eicher solved a similar problem he was having. I hope this is exact and it can be useful, thanks again! Tara, great tutorial series so far! However, when we start animating sprites I run into a problem where the sprite simply flashes in and out. I think it stems from me missing the (Graphics//ShipAnimation) file. Any chance you could upload the file? What a great set of tutorials! Thanks for this amazing effort! I'm having a little trouble here with the ship going out of bounds.